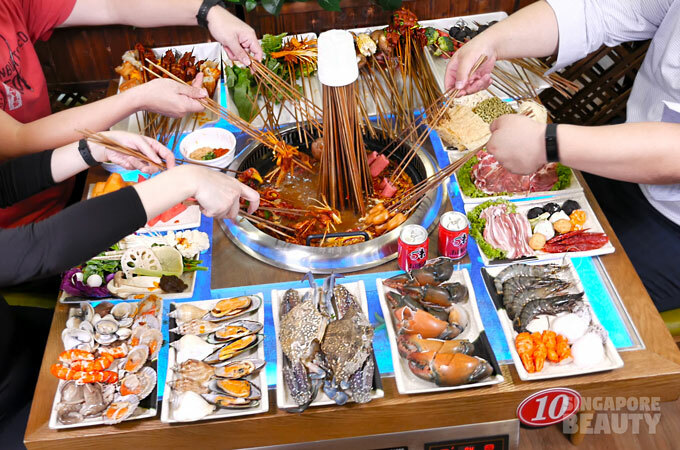 Jin Men Da Yuan Steamboat （锦门大院火锅）is having a 50% off promotion in their Singapore flagship restaurant for this Chengdu based steamboat group. 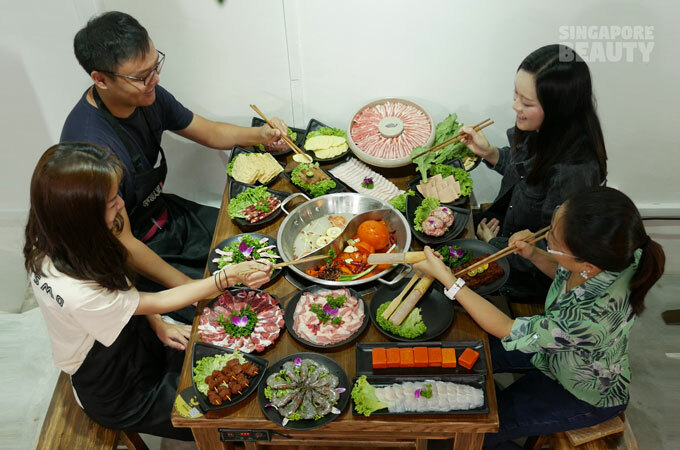 After 50% discount, the cheapest item on this ala carte steamboat is only 50 cents! 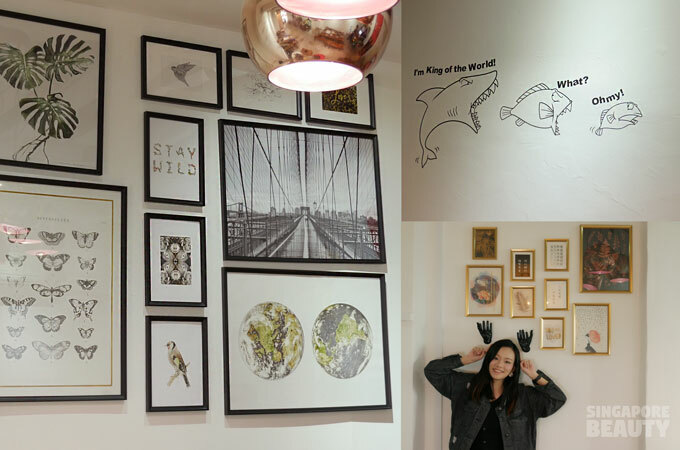 This is to celebrate their official opening 2 weeks ago on 17 Nov 2018. 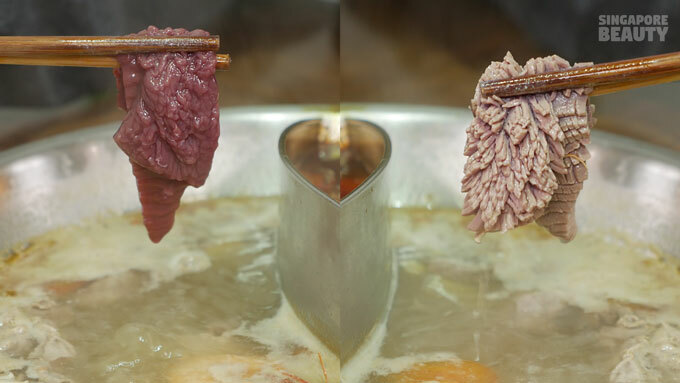 Jin Men Da Yuan Steamboat only offers 2 types of soup bases for their diners. 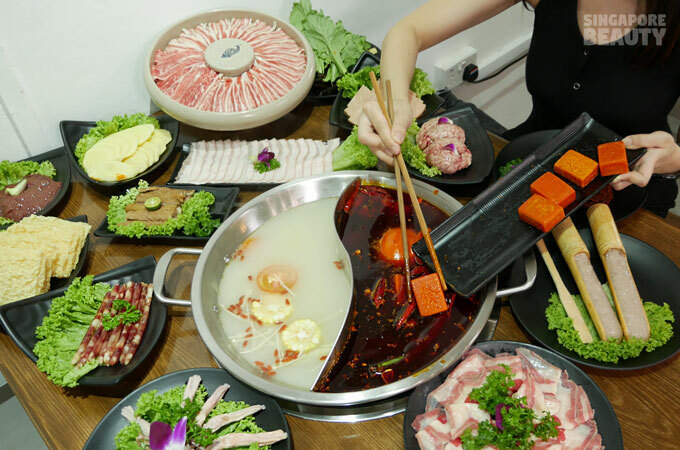 When asked why only 2 choices, the reason is very simple – they have perfected these 2 soup bases and only wanted to offer the best for their customers. The Mala soup is made using good grade butter that is less greasy, smoother and more aromatic. 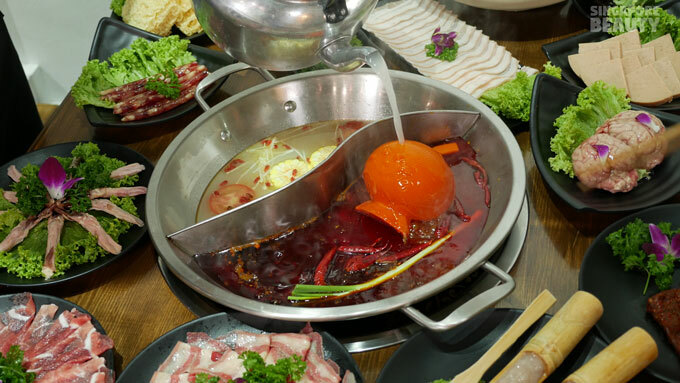 The reason for using butter is that butter is richer and helps to mellow the spiciness of the hotpot. and even life size mahjong tiles. 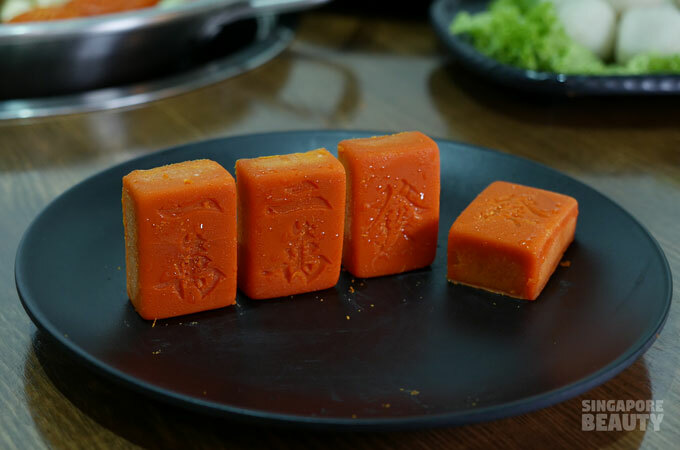 These are the only mahjong tiles that are edible and are good enough to be eaten! 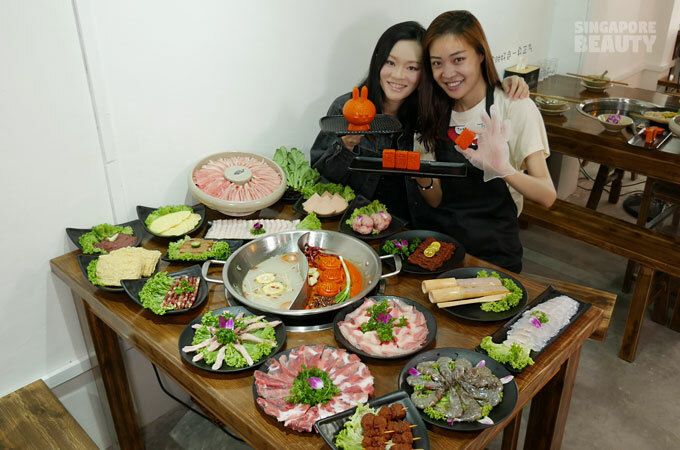 You can even play a friendly game of mahjong lucky dip and walk away with a 90%*discount off your bill. 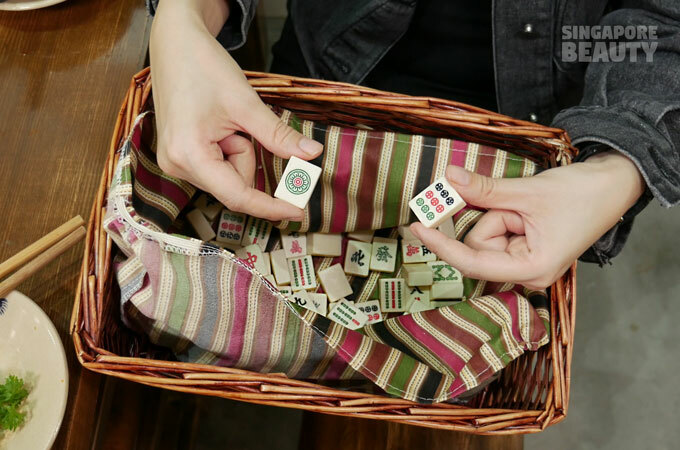 This is how it works: dip your hand into a bag of mahjong tiles and feel for the round green dot mahjong tile in the bag. If you manage to pick it, you get 90% off your bills. Different mahjong tiles will give you different discount that range from 10% to 90 %, the service crew will brief you when you are playing the lucky dip. Good luck! 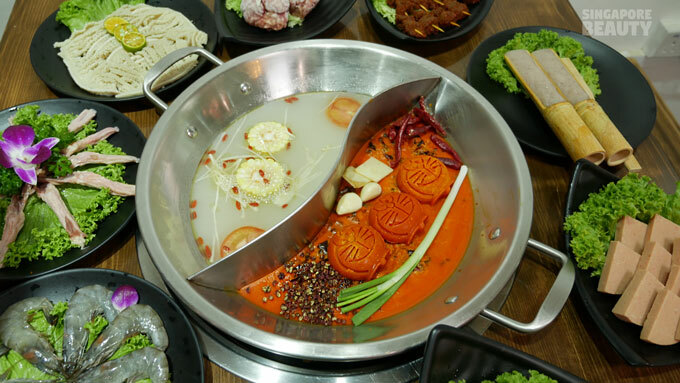 You can adjust the intensity of the Mala soup base by reducing the number of Mala tiles in your soup. I like mine intense and strong. 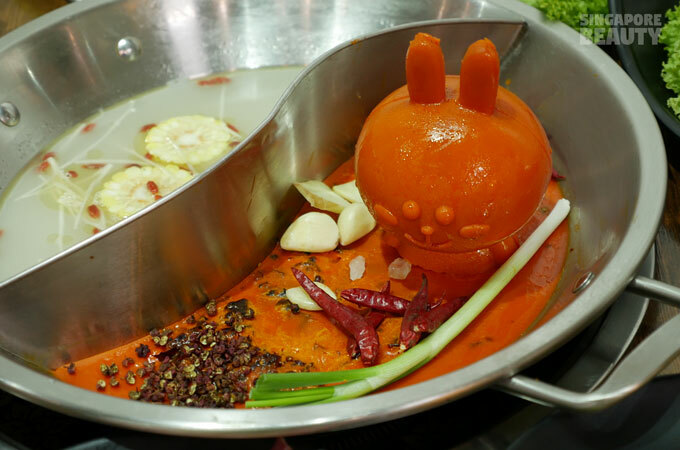 Watch the mascot sinks and melts as the mala soup boils. 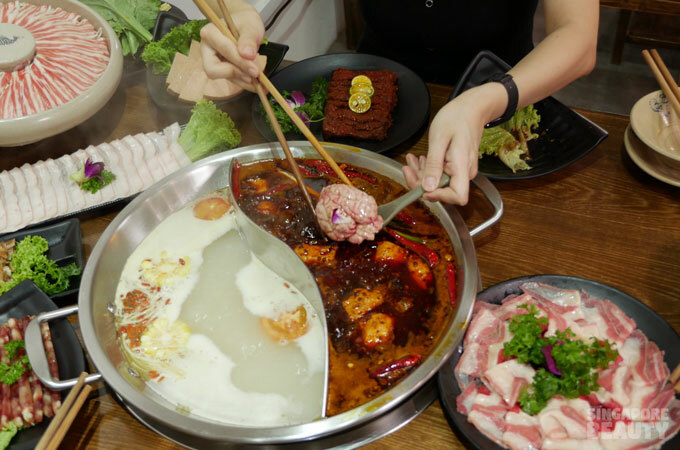 Big bone soup is made from scratch and signature Mala soup is imported from their Chengdu restaurant’s central kitchen. 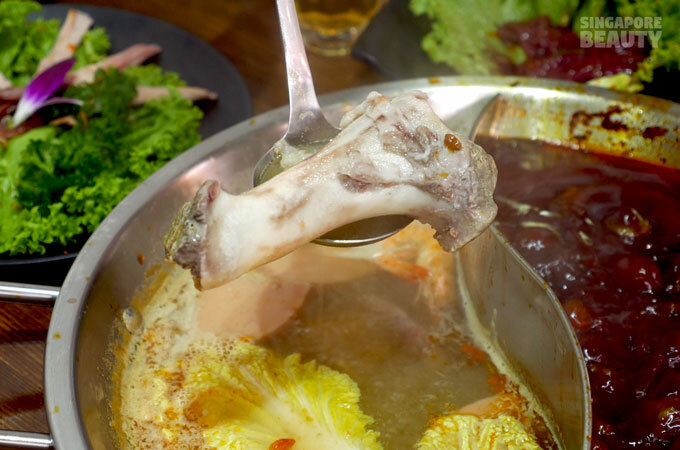 Big bone soup is boiled with constant stirring for at least 6 hours with loads of pork big bones, whole hens, chicken feets, chicken rib cages and pork skin to achieve the thick milky collagen like soup base. The soup is ready when the bones, marrows, rib cages, cartilage and pork skin are almost “melted” down and the clear soup turns a snowy cream colour. 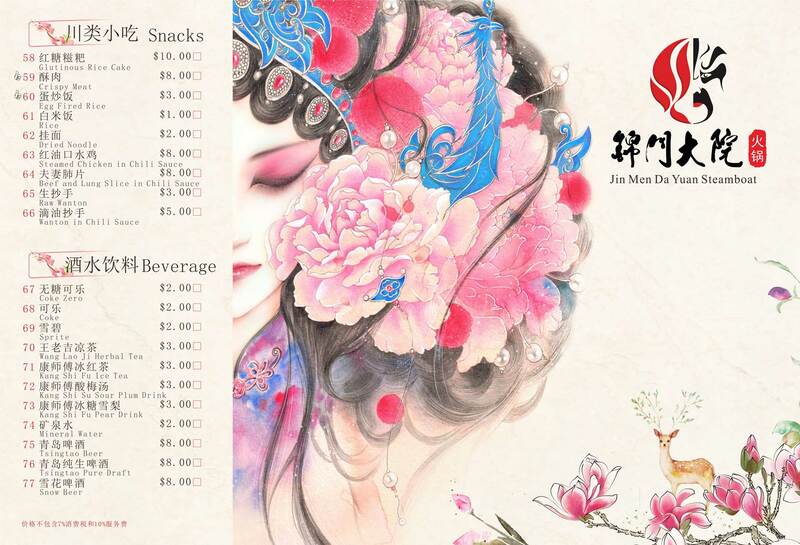 Menu image credit: Jin Men Da Yuan Steamboat The menu has more than 70 types of meat, greens, snacks and beverages for selections; you will be spoilt for choice. 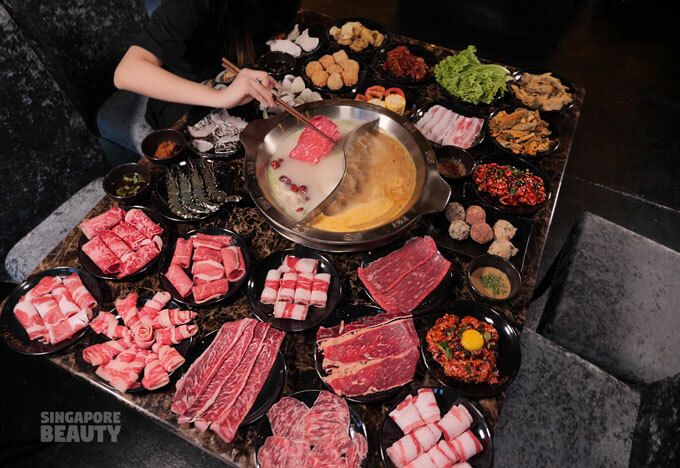 Shabu shabu meat such as mutton, wagyu beef, prime beef slices, housemade tender beef and spicy beef are available for a fraction of the price you would get at similar steamboat outlets with this promotion. 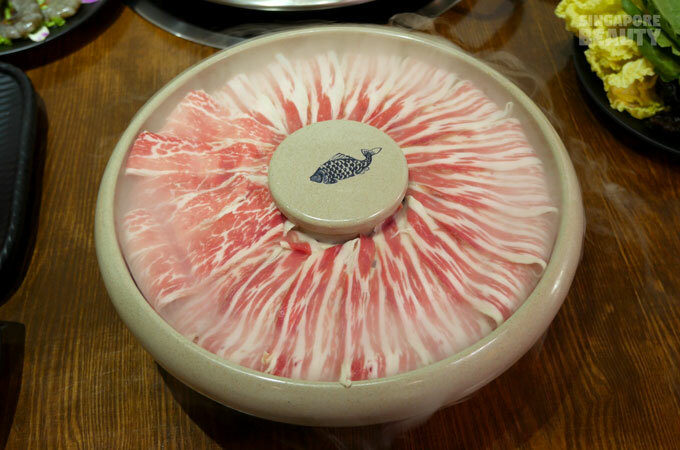 Wagyu beef slice platter is presented on a cloud of cold dry ice. 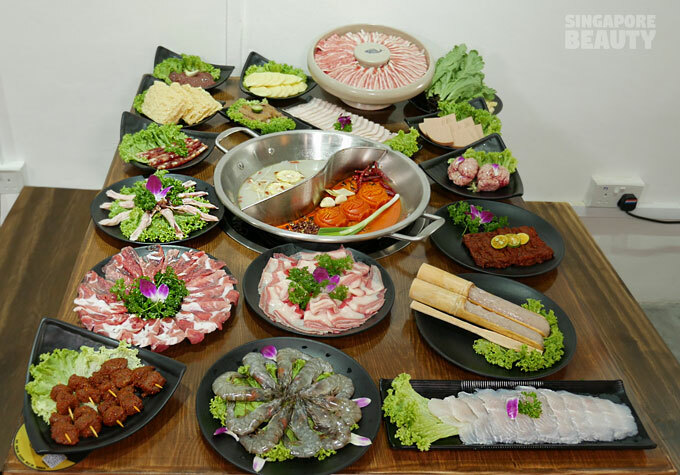 This platter is as big as the steamboat. These wagyu taste as good as their presentation. Even for non beef lovers, you will grow to love them. 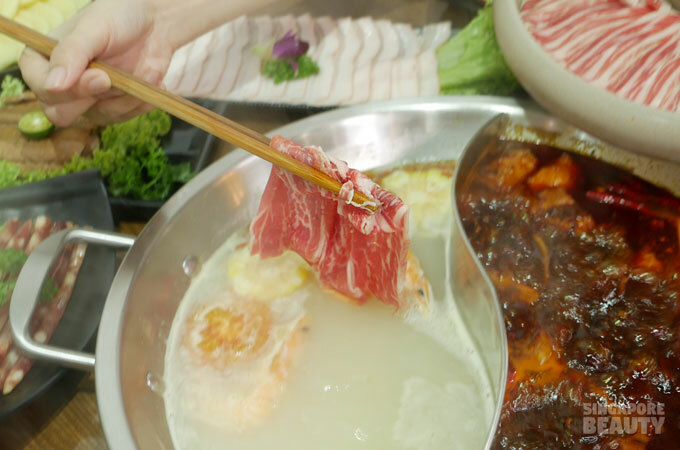 They also have shabu shabu mutton. 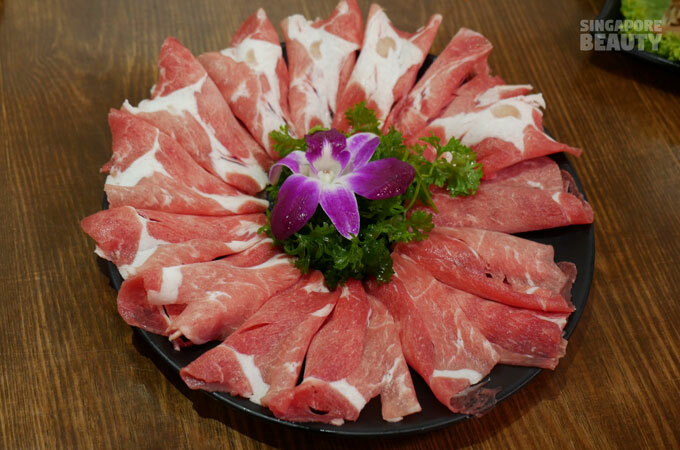 The prime beef slice is melt in your mouth type with excellent proportion of marbled streaked fats and tender meat. Shabu shabu these in the mala soup and watch the meat curl as they get coated in the savoury mala butter. 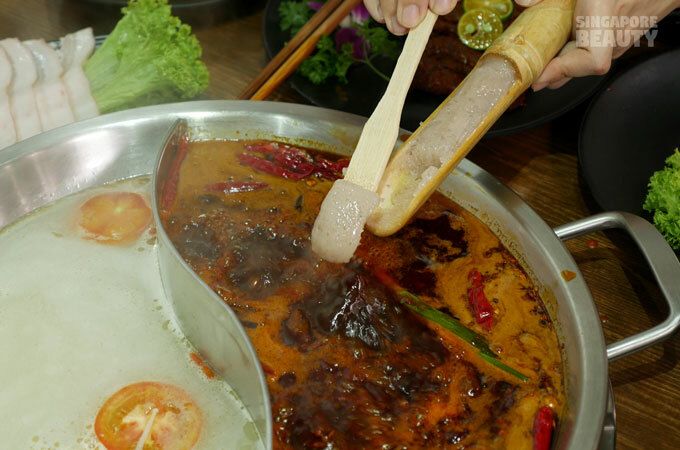 Duck tongue is considered a delicacy in steamboat as the demand is high but supply for the duck tongue is low. These are the most tender and prized part of a duck. 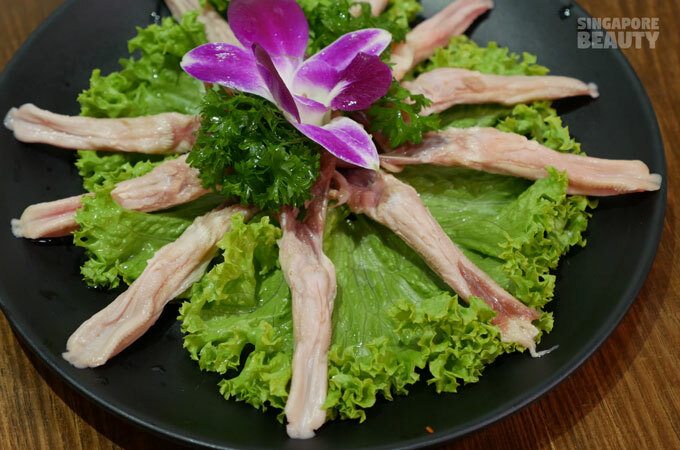 The cooked duck tongue is an extremely flavourful morsel of braised soft gelatine bite with a soft bone cartilage. This literally melts in your mouth and is a must-order dish when you visit them. 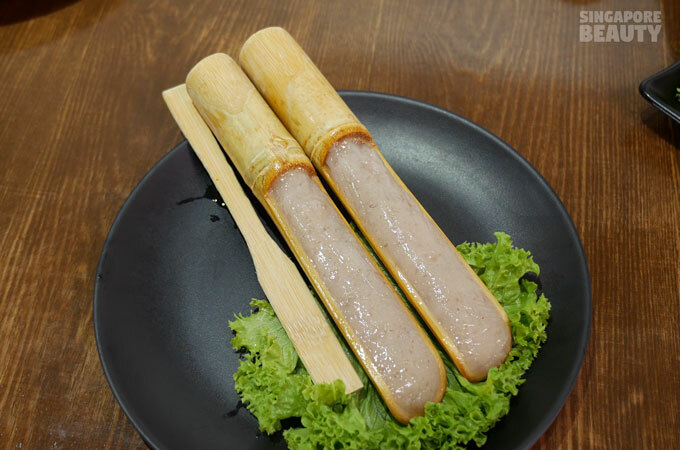 Handmade minced prawn paste is served in a real bamboo shaft. Each stick of bamboo makes about 4 prawn balls. 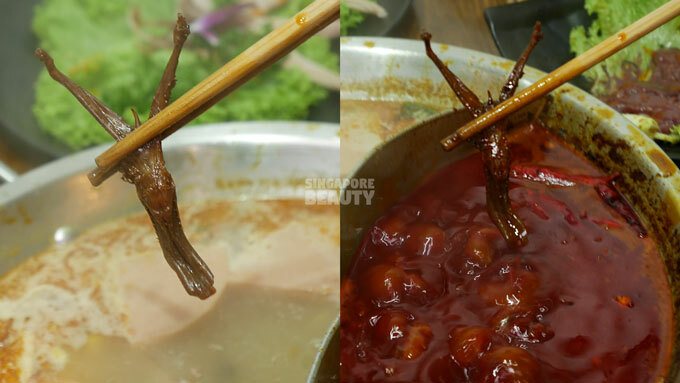 These springy cooked prawn balls expand to twice their size. You can taste the intense briny prawn flavour even in the buttery mala. 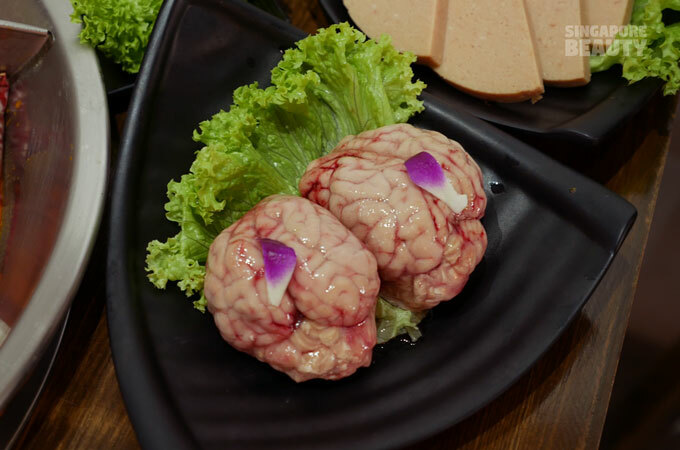 Pork brains are also another prized staple that every steamboat should have, but sadly not so. These seemingly intimidating looking brains are the best meat dish to go into a pot of Mala soup. Some shy away from this because of the stigma of it being a brain. But if you eat this from the view point of a food connoisseur, you will love this for its unique creamy, custard yet firm enough to hold texture when cooked. 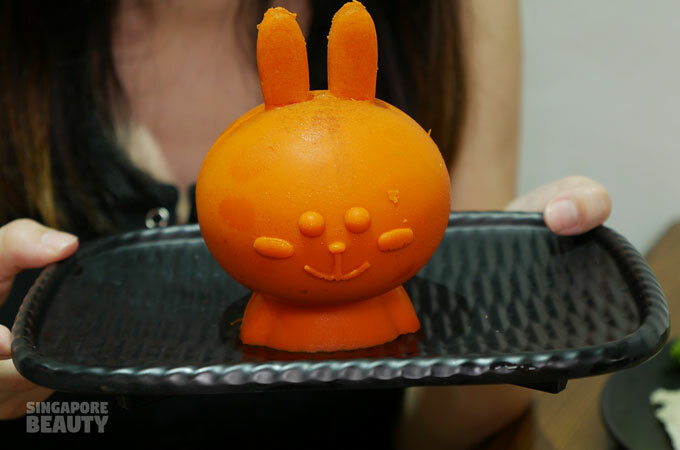 This takes around 12- 15 minutes for the brain to be cooked and eaten at the optimum texture. At 12 minutes cook time, you get a creamy and melts in your mouth buttery texture; at 15 minutes, you get a custardy and firm texture. I like mine at 12 minutes. 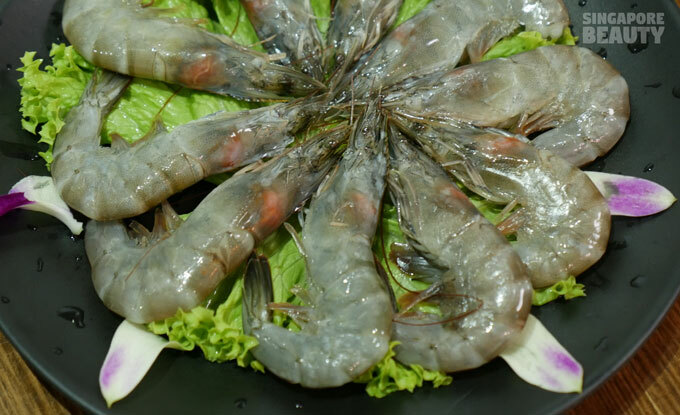 For seafood lovers, they also serve prawns, fish and crabs. 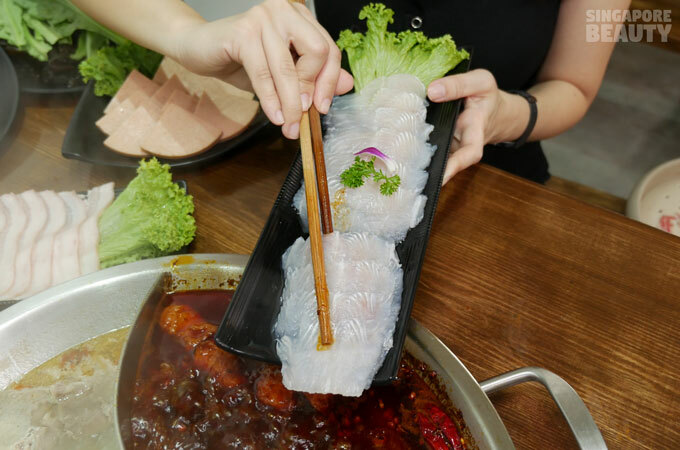 The fish slice platter takes on an interesting white radish form. 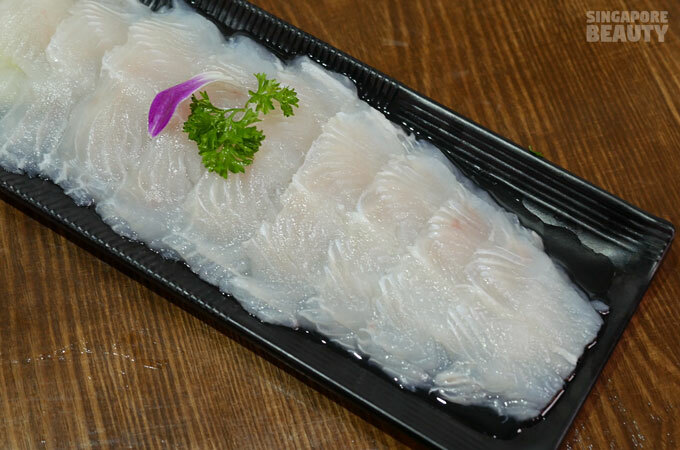 Fish are sliced a little thicker than normal for a firm bite with delicate texture. 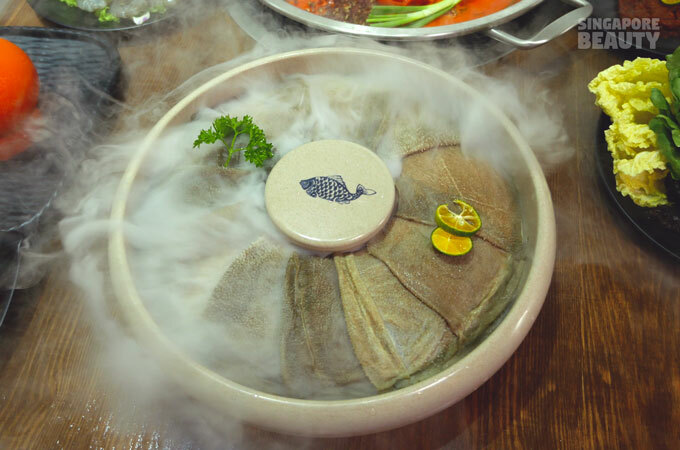 The fish they use has streaks of fish fats that make them more delicious when cooked. 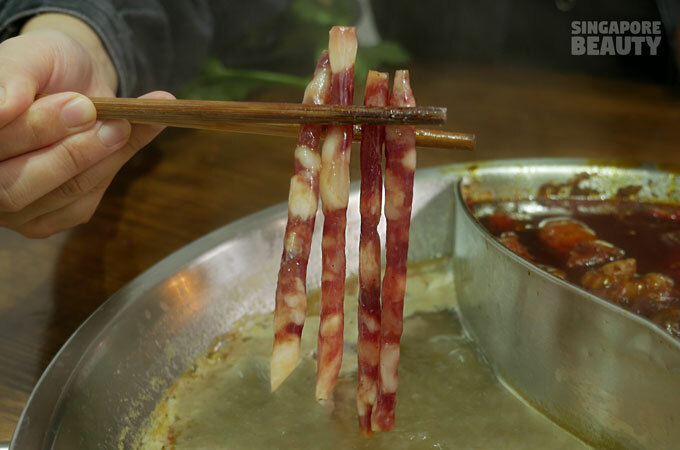 Braise pork intestines are one of the dishes that has an acquired taste not many can appreciate. However, if you know how to appreciate good braised pork intestines, this dish is for you. For me, I have no complaints for it as it is how a dish of good braised intestines should be. 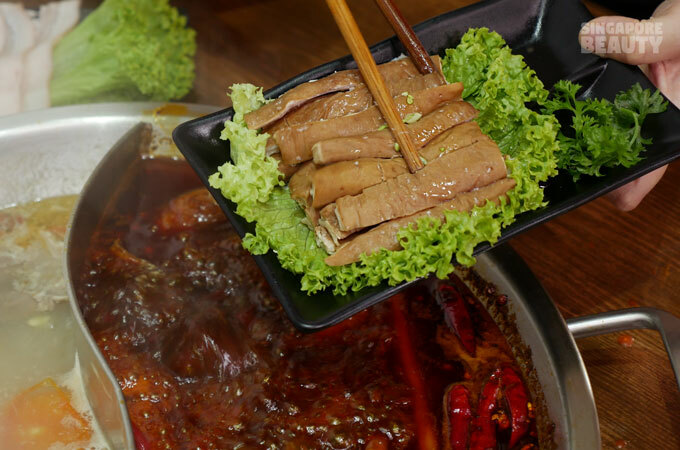 No earthy odour remains in the pork intestines but one that is infused with the goodness of five spices used commonly in braised pork innards. These are beef tripes that are great for Mala soup. 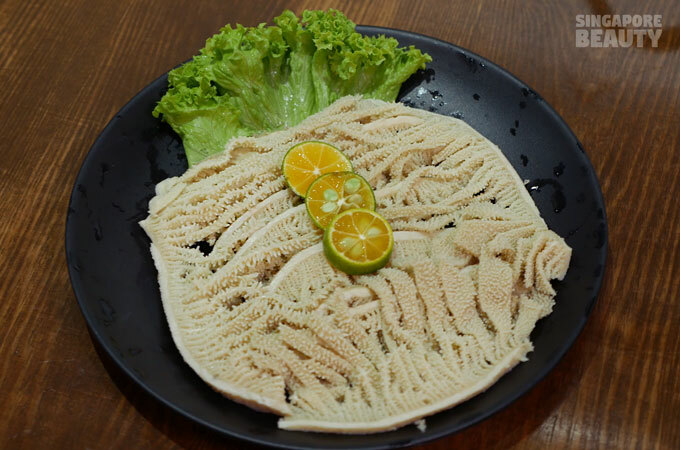 If you want to “Huat”, you can also order these tripes that are presented like a pineapple. How about some beef omasum? These will soak up the goodness of the mala butter. Homemade spicy beef sticks marinated and coated with a layer of chilli flakes paste. These chilli flakes cling on to the meat after cooking and add more heat to the meat. 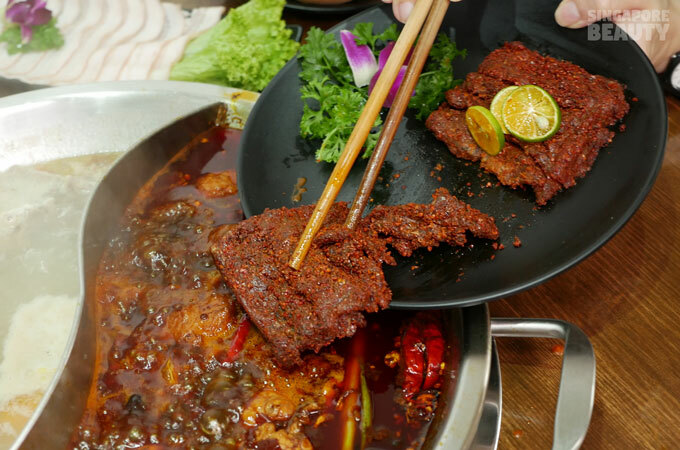 If you like spicy beef, this will please you. 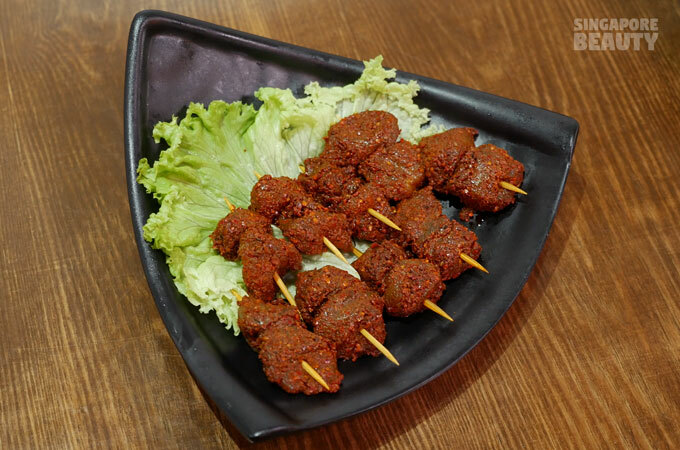 Spicy chicken sticks are marinated the same way as the spicy beef. 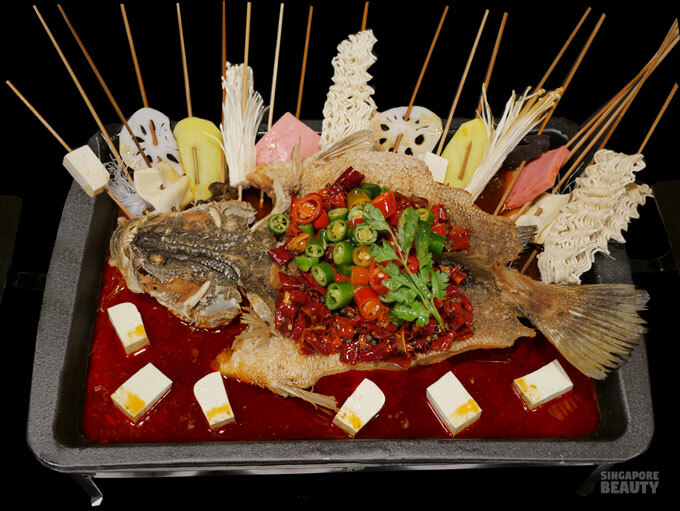 You can put the whole stick in as advised by the service staff and are ready to eat when they float to the surface. 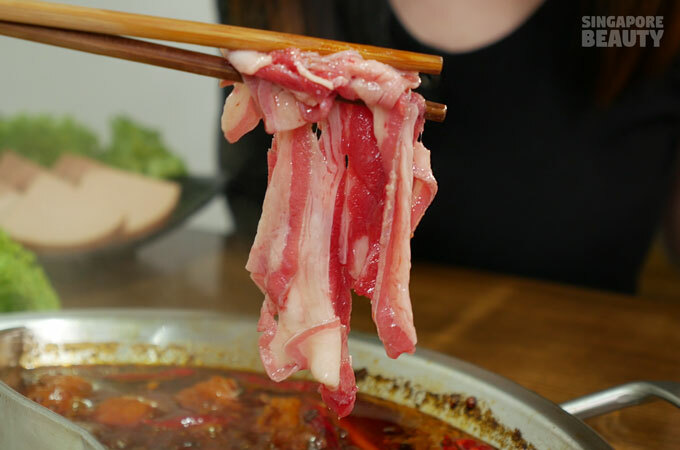 Pork kidney slice is great for the big bone soup which helps to retain its crunch and flavour. Each individual slice is meticulously scored with a knife into a criss-cross pattern like petals of a flower. Cook these lightly. They are ready to eat when they are slightly brown with a pink undertone. Chinese sausages that taste like Taiwan sausages. These sausages are crunchier due to the higher fats to meat ratio. These are the slimmer version like witch fingers and a joy to eat. Pork slice has a very high fat versus meat ratio. 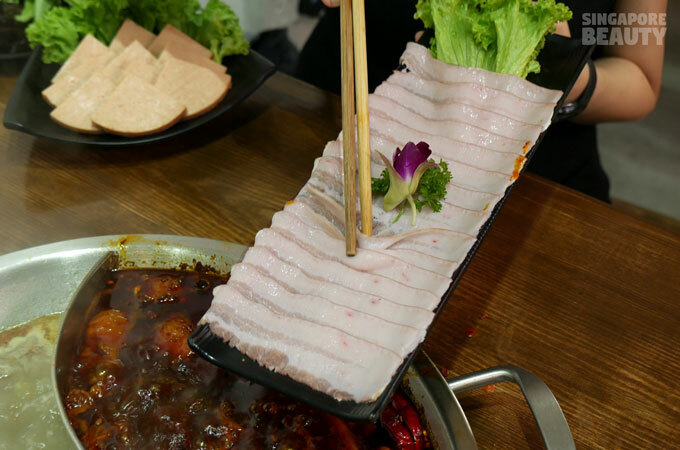 You get translucent ribbons of pork when cooked. When you overcooked these, they will just dissolve and melt away into your soup base. 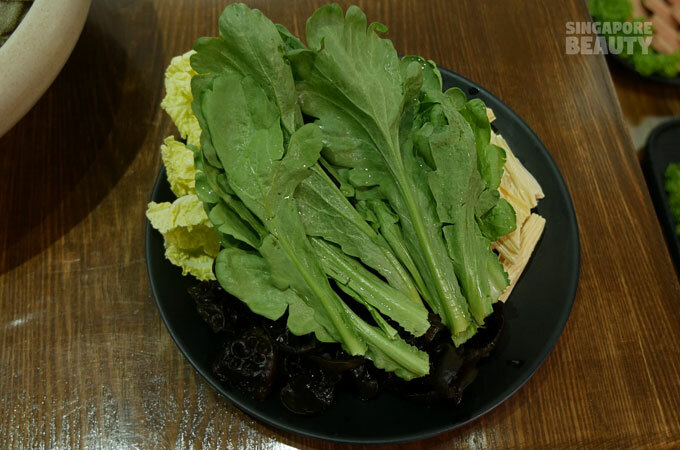 Tang ho or coronarium is a type of vegetable that is favoured by steamboat lovers. Many love this green due to its unique flavour as well as the associated anti-oxidant health benefits it brings with it. 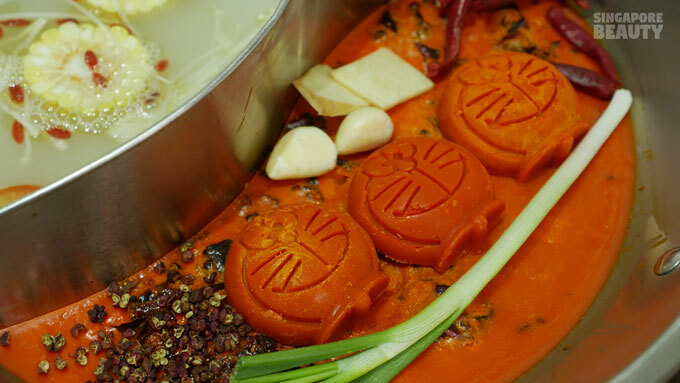 The flavour is matrimony of parsley and celery with a sweet undertone when cooked. 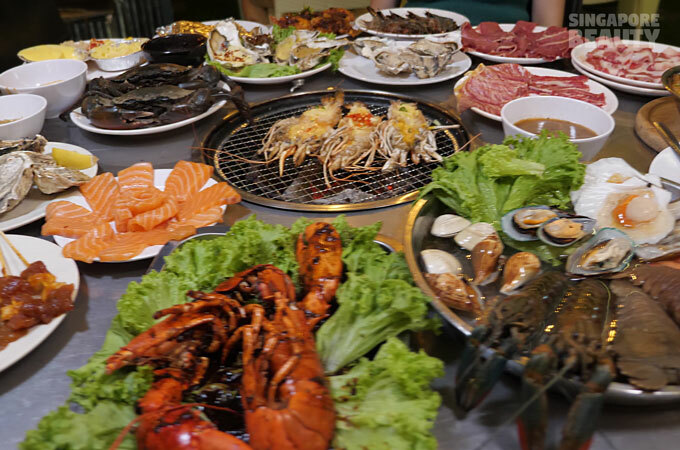 Jin Men Da Yuan steamboat restaurant is a great for groups of 4 pax or more. The neat flexible scandi-chi interior is spacious with a modern, young, hip and minimalistic design. The whitewashed walls are monochrome with riddles that gets you thinking. 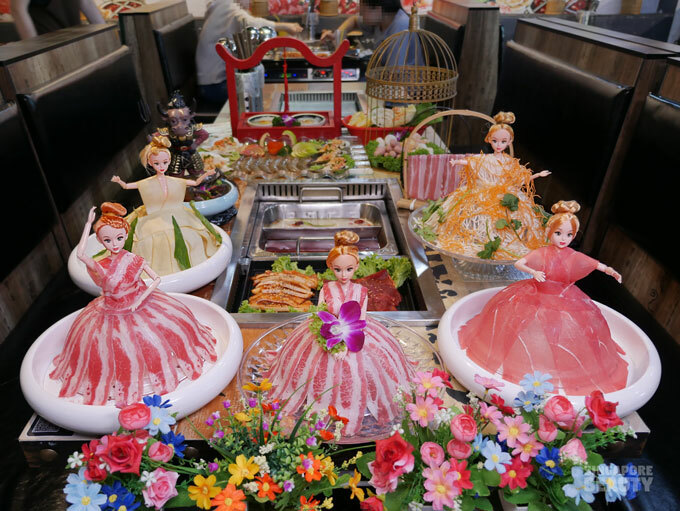 Food and fun are beckoning, head over to Jin Men Da Yuan today. Storefront image credit: Jin Men Da Yuan steamboat. 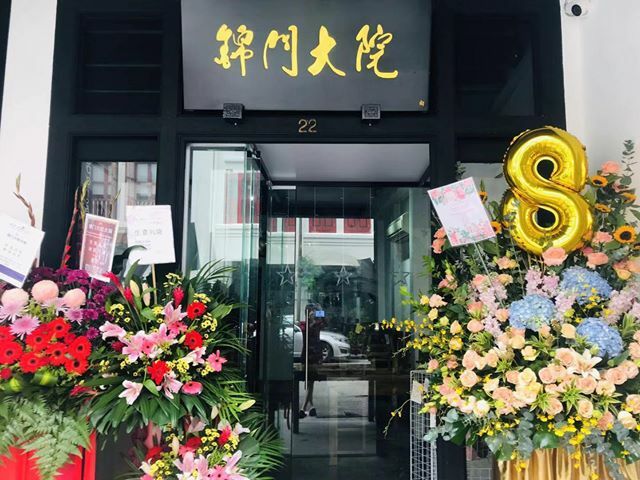 This is the classy and no frills entrance to this Chengdu style steamboat. With all these unbelievable attractive and real promotions, we shall see you there! 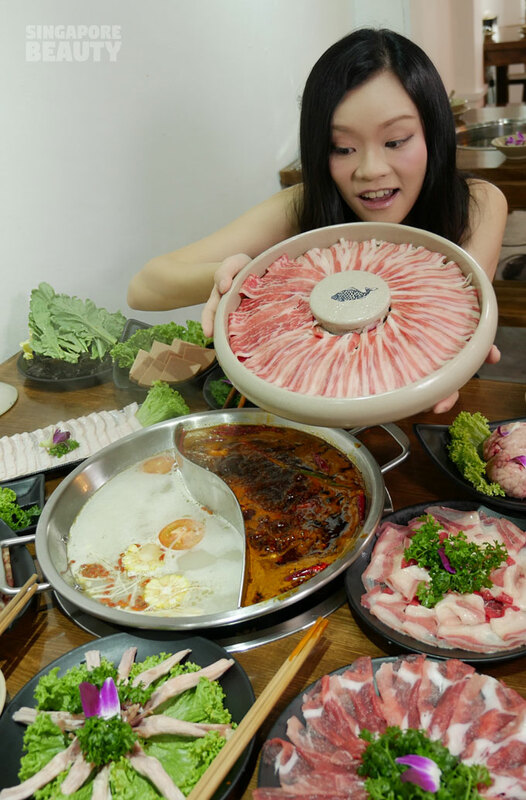 Jin Men Da Yuan steamboat restaurant is（锦门大院火锅）is located among a line of nostalgic and heritage shop houses in the Chinatown touristy stretch. A short enjoyable walk from Chinatown MRT station. 50% discount for diners from Mon to Fri (exclude PH) if you dine between 11am to 3.30pm! Every Friday, Saturday and Sunday – diners are entitled to mahjong lucky dip at 7 pm and 9 pm respectively. The mahjong tile you picked will decide the amount of discount you are entitled to. The discount ranges from 10 % to 90 % off your bill. 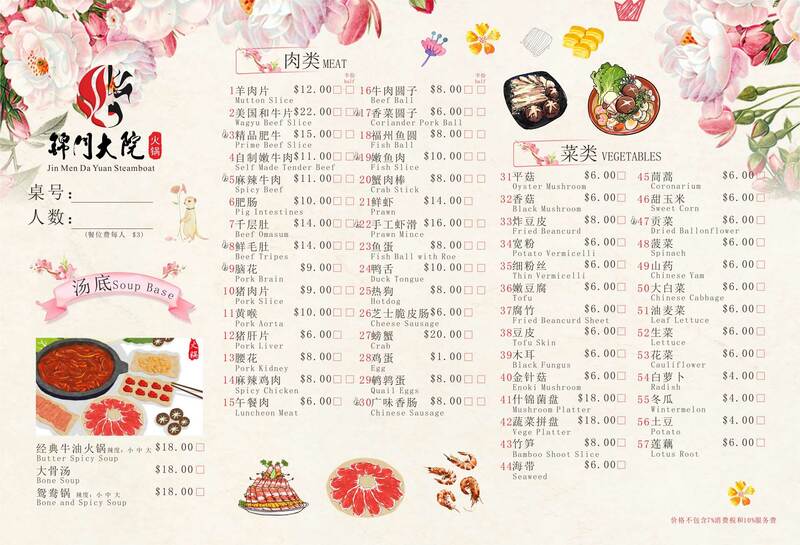 Follow them on Wechat app and grab the angbaos given out by them on every Monday and Wednesday. 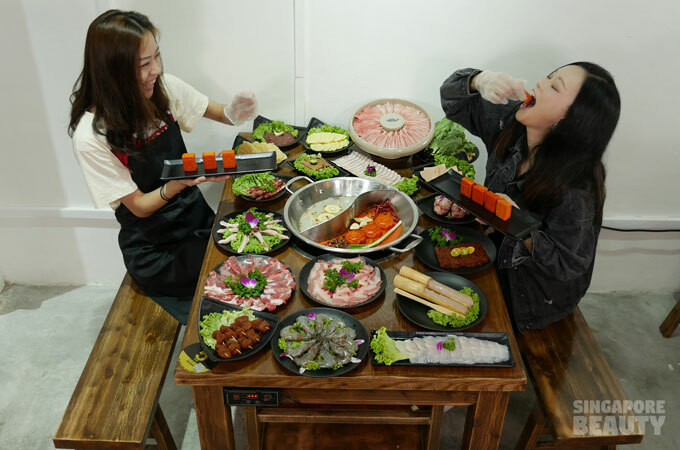 The top prize is a free meal voucher of $188 without minimum spending, the second prize is a 30% discount and the third is 20 % discount.